The living part of any tree is right under the bark layer. 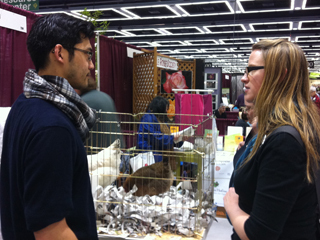 My friend Jessi Bloom, who has supported me in too many ways to name, asking a vendor at NWFGS 2011 if they might lend her a chicken for her seminar on chickens — another team effort! The 2012 Blog Action Day Theme, “The Power of We“, got me thinking about how much we can accomplish when we come together to effect positive change and advancement. It also made me think about how little gets done when we refuse to listen and work together and compromise. Yet, I’ll leave the political agenda off the table today and focus on the positive — the power of we. Coopertition is one of my favorite made-up words. I’m not sure who coined it, but its a good one. 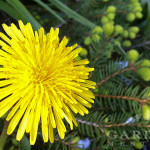 My fellow garden professionals — writers, coaches, designers, arborists, etc — definitely compete for work. It’s how we survive. But, the most successful among us tend to be the most generous and nurturing in the group. By that, I mean we lend a helping hand when someone is down. We listen and discuss challenging issues and questions without any judgement. (Or, if we do judge, we do it politely to ourselves where nobody else is listening.) There are no stupid questions! When we run into a challenging problem — whether it has to do with an employer or a client or a damn plant or pest that we simply cannot ID on our own — our co-horts — aka We — are there for the One. When it seems our well of work has dried up for the season and we’re about ready to eat the last lentil in the cupboard, somebody jumps in with a client referral or a new idea for work or maybe even a subcontract. Together, we are stronger. By networking and building each other up, we survive in a tight economy. We grow in our industry and are therefore better able to serve our clients and the environment. We team up together to “fight the good fight” through the power of numbers. We lobby. We blog. We inform. We tweet. We make noise. Together we are stronger, smarter and better. And, we make the world a better place. Although I could point to any number of my fellow co-horts and tell the story of how we have empowered one another, I’ll share just this one, which leaves me thankful and with food on the table each day. 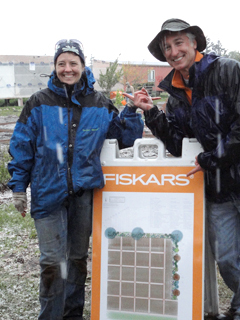 My friend KP and me nearing the end of our one-day Fiskars Project Orange Thumb installation in Portland, Oregon. Yes, we are hamming it up for the camera! Several years ago my friend Joe Lamp’l of Growing a Greener World TV fame asked me to help him design a Fiskars Community Garden design for a Project Orange Thumb grant project in Portland, Oregon. (This was before I became a paid writer for Fiskars.) I was happy to help him pull the design together to help build community and empower a community to grow a garden and grow their own food, and fortunately everyone seemed to like it! When the time came to install the garden, I offered to help build it. My good friend KP asked if she could join us too. She took a couple days off work, and we drove South. We met Joe the day before the community members arrived, and helped string off the design on a soppy, chilly day. The next day members of Fiskars, Home Depot, many members of the local community, Joe, my friend KP, and I showed up to build. 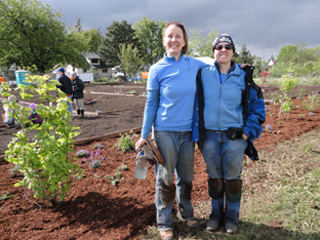 Together we built and installed a community garden in just a day — despite some crazy weather. Again, there’s that We. In just one day WE came together and built a garden complete with edible beds for locals to farm, surrounding mixed herb and edible gardens to attract pollinators, paintings to add beauty and a shed to store tools for the community to use. It was a beautiful day and a beautiful thing seeing so many people so enthusiastically come together to convert an abandoned field into something we the people can use to feed ourselves and build a better environment. Yes, I’ve benefited from that day; that’s part of the power of we — building up the individual! I connected with Fiskars and was shortly after asked to become one of their gardening expert writers, I bonded with Nest in Style‘s Jayme Jenkins with whom I’ve teamed up on several subsequent occasions, I was invited by producers Joe & Theresa to become a contributing writer on another powerful “We” team — Growing a Greener World, and I’ve been able to recommend and promote others within this wonderful, powerful network of We. Every opportunity I’ve been afforded allows me to provide opportunity to others. Each individual is a part of the greater We. Life doesn’t have to just be about competing. It can be about cooperating too. Hence: coopertition. We build each other up. We care for each other. We empower each other. We grow together. Life as a team effort is a beautiful, powerful, empowering thing. Thanks friends. Without you, my power is diminished. Together we have power — enough to share! Green Code Provisions Code Draft Needs Your Review, ASAP! 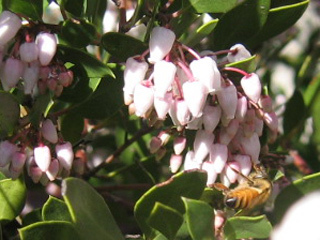 Manzanita grows great here & feeds all sorts of pollinators, but it’s a California native plant. Will this new policy make it illegal in some applications? If you garden (at home or professionally) in Seattle or other areas of Washington state, you need to read the draft Green Code Provision for Healthy Landscapes, which is now open for comment. But, you need to read it right now, spread the word, and comment fast. If passed as written, these proposals have the potential to significantly limit what anyone can plant anywhere at any time in our area. It may also limit overall use of landscape space. Although the intent is noble, in my opinion, this draft is unrealistic and a potential job killer. Do you want to grow vegetables? Do you need to do construction that will require re-landscaping? Do you want a new patio, deck or play structure? Do you want to add space for dogs, goats or chickens? Do you want to create habitat and forage for honeybees and other wildlife? Do you want more choice in plant diversity? Do you grow plants and sell them? If you have answered yes to any of these questions (and I could ask more), this drafted policy change may affect you. The draft code change is available here. It is very short, so read it, please. You are welcome to download my letter and use it as a model for your own response or to just read it to understand our position. (My letter is much longer than the draft, so get a glass of tea in hand before you dig in.) As stated in the letter, I welcome any input to our own response, and look forward to continuing to educate and develop healthy, functional landscapes together. -Robin Haglund, Founder & President Garden Mentors inc. Grants for Gardens – Get Your Application in Before It’s too Late! Quite often I’m approached by non-profits, schools, community centers, public gardens, historical gardens and other struggling organizations seeking donations. Groups like this are constantly struggling to stay afloat and build new learning opportunities and beautiful spaces. The economy is tough right now. Donations are down, communities are strapped, but that doesn’t mean a community as to go without the financial assistance necessary to get their gardens growing! Sure small donations from folks like me help, but why not tap into those with deeper and quite generous pockets as well? Each year Fiskars® grants over $50,000 in tools and cash toward the development of gardens all over the world. Each year they accept applications from communities in need and from those applications select 10 winners to each receive a $5000 “Project Orange Thumb” grant. Five grand may not seem like an awful lot, but really it goes quite a long way. Matched with the enthusiasm and labor of your community, some pretty amazing transformations happen quickly. October 15, 2010 is Blog Action Day. This year’s topic is water. I considered writing any number of articles on life-giving water, but I decided last year’s article simply needed to be repeated. The 2009 Blog Action Day topic was Climate Change. For that subject, I covered the subject of capturing water in urban settings. Today the same idea is as relevant as ever. I encourage you to read on to learn more about various ways homeowners can capture and recycle water falling from the sky. 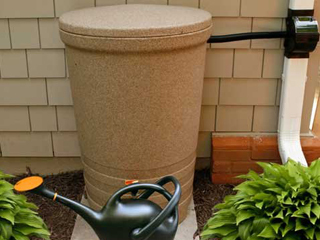 And before you dive in, consider checking out the Fiskars site to learn about their great rain barrel systems, plus visit their handy-dandy Rain Barrel Rebate Finder to see what kind of refunds and credits your community might offer for adding rain capturing to your garden! Earlier this Spring, Joe Lamp’l, host of Growing a Greener World TV, invited me to pitch in and help on a community garden project he is heading up in Portland, Oregon. In addition to picking my brain for ideas while developing the garden, he also invited me to join him in Portland later this week as the garden itself is installed. How could I resist? So, tomorrow, I’m grabbing a good friend and truckin’ down to Portland where we’ll be helping the community build this new garden space, which is a part of the Fiskars Project Orange Thumb Grant Program. 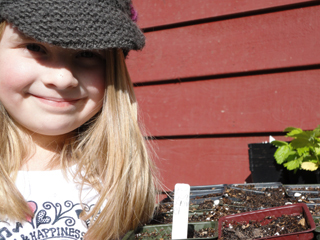 Project Orange Thumb is a generous grant program that began in 2003 to assist communities meet their needs in building gardens and garden education programs. Each year, Fiskars receives over a thousand applications for these grants from around the world. From those thousands of applications, 25 programs are selected to receive Fiskars tools, shirts and other gardening materials like mulch and seed, which enable them to put together their gardens. Together with learned volunteers like Joe, my powerhouse gardening pal Kristin, me, and anyone else willing to lend a hand, communities are empowered through these grant programs to grow and flourish in spaces that speak to togetherness and good food! Be sure to tune into Growing a Greener World TV over the months ahead to catch Joe and me chatting about honeybees in my own garden in their honeybee segment in June. And, keep your eyes on the schedule to catch a glimpse of the Portland community garden we’re working on as well as many other community gardens growing together in their forthcoming segment on community gardens around the country. And, stay tuned to gardenhelp.org. I hope to share photos and tales of our Portland visit — from the community garden project to the stunning Portland Chinese garden we plan to visit to specialty nursery Cistus where I’m likely to break the bank to the fun, quirky The Kennedy School where we’ll be staying.